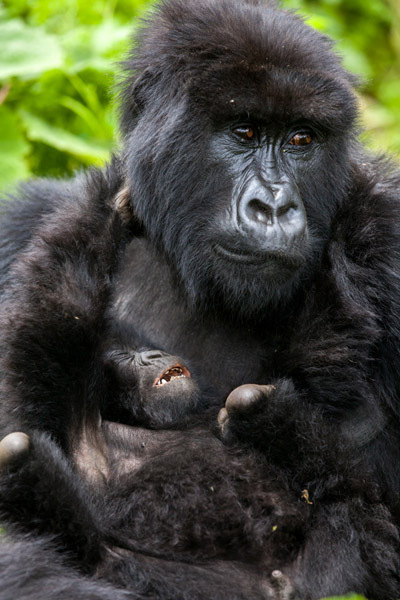 A female mountain gorilla engulfs her three month-old infant in an embrace in the jungle of Rwanda's Virunga Mountains. Waking up at the foot of the Virunga Mountains–a massive chain of volcanic mountains that borders Rwanda, Uganda and the Democratic Republic of Congo–the first thing I saw was a perfect cloud cap covering the peak of Mount Karisimbi (14,763ft), the tallest of the volcanic mountains in this area. Up in the jungle of these beautiful mountains resides the greatest concentration of mountain gorillas left in the world. Perhaps most will know this region from the 1988 movie “Gorillas in the Mist” which centered on naturalist, Dian Fossey’s work with these primates. I’d come to see these same gorillas and with the rich, green mountain range looming up before me, I had a great sense of anticipation. 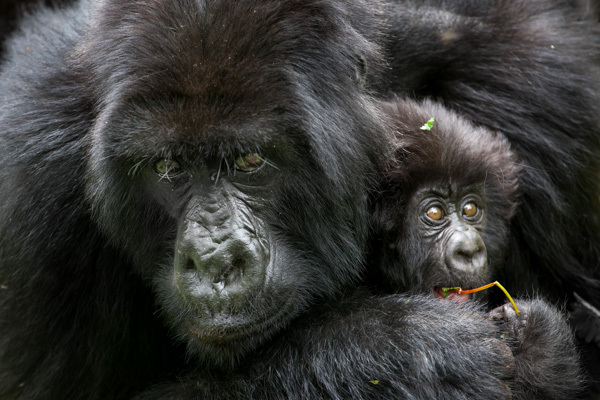 With the advent of gorilla tourism, eight gorilla families out of 17 in the Virunga Mountains are habituated to humans. 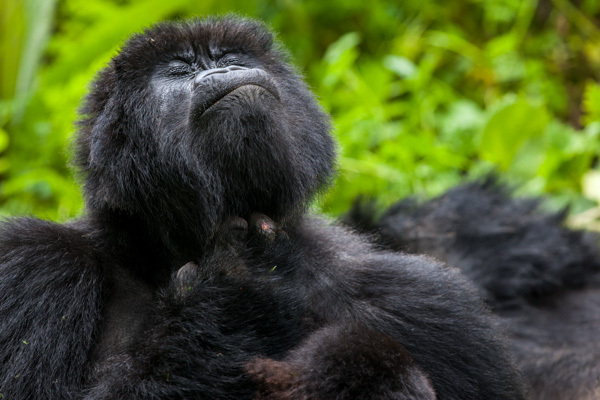 Tourists interested in seeing the gorillas may hike into the mountains in small groups and can, for one hour, quietly observe a gorilla family in its natural habitat. While some might be critical of daily exposure of gorillas to humans, gorilla tourism has been instrumental in decreasing gorilla poaching as many of the poachers are now employed as trackers and porters and are therefore invested in preserving their gorilla population. 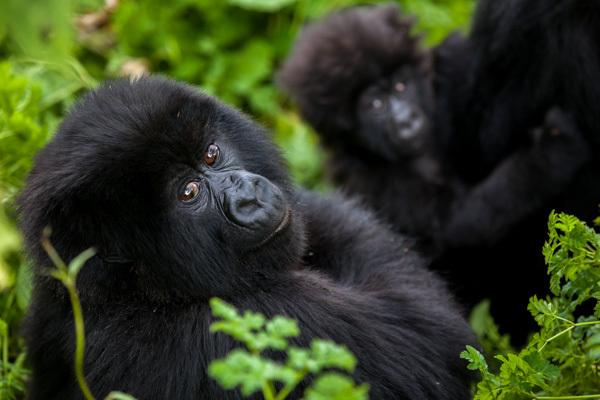 Also, the fees from trekking permits offset the cost of gorilla conservation and boost the economy of the towns at the base of the Virunga Mountains. 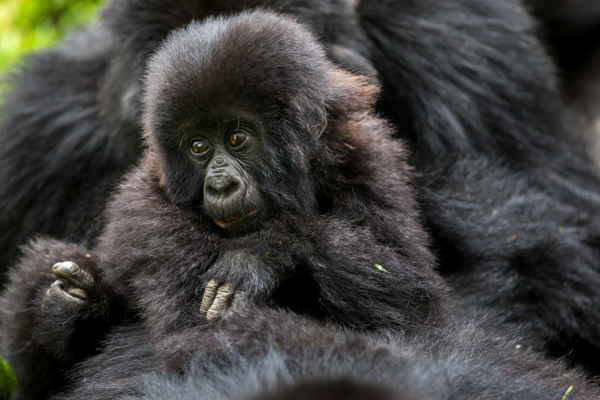 My particular group of trekkers was assigned to the Ngambara gorilla family which has 17 family members including three infants. Soon after our group began the ascent up Mount Bisoke, it was clear that this would be a tough hike. Starting off at over 8000ft above sea level, our lungs already struggled with lower oxygen levels and the steep climb quickly left us out of breath. Our guide, Felicien, warned us not to touch the giant stinging nettle leaves which loomed up on either side of us. Felicien stopped at regular intervals to check in with the trackers and see where our gorilla family was located as well as inform us of some fact about the flora and fauna. 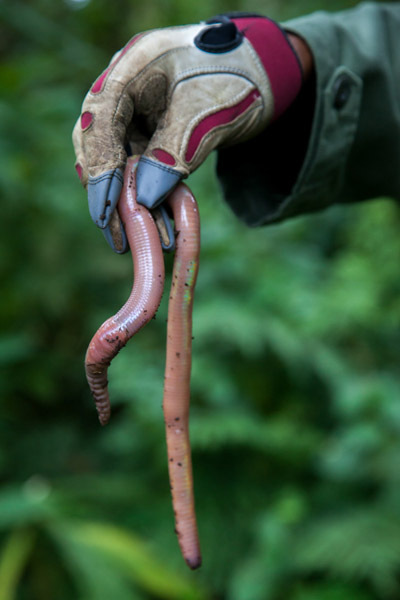 At one point, he stopped to show us a massive earthworm the size of small snake. This area also boasts a variety of other wildlife such as golden monkeys, spotted hyenas, forest elephants, buffalo, giant forest hogs, bushpigs, bushbucks, black-fronted duikers and large variety of birds. After several hours of hiking, our group veered off the main path into the thick jungle. Above us, Tarzanic vines hung in ropy masses and tall trees rose up like quiet giants. The stinging nettles grew so densely here that they were now almost impossible to avoid. Despite wearing long-sleeved clothing, long pants and gloves, the nettles stung through our clothing. By now we’d connected with our trackers and one of them used a machete to cut through the dense vegetation. After some time of hiking through this denser jungle, Felicien stopped us at a large tree and told us to put down our backpacks. “We don’t want the gorillas to smell any food you have with you,” he explained. He then lead us further into the thicket. Suddenly, Felicien began making a series of low rumbling belching grunts indicating contentment. Earlier, he had demonstrated a variety of sounds gorillas use to communicate and had suggested we use the “contentment” sound when in close proximity to the gorillas. Moments later, I got my first glimpse of a mountain gorilla. 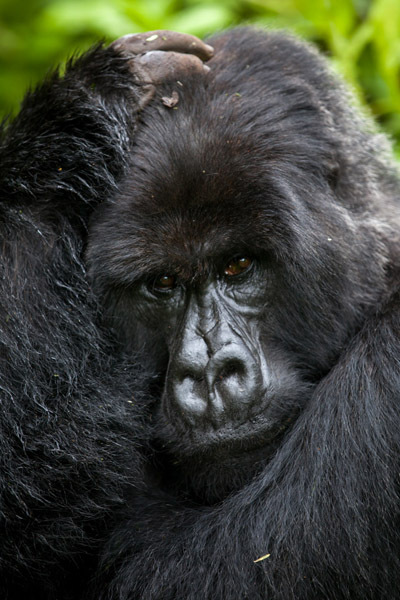 He was a large silverback sitting quietly and cradling his head. He sat so close to us, I could see the movement of his eyes and smell his earthy gorilla scent. I was mesmerized. Felicien told us that there were three silverbacks in this family group and that this one was second in rank. Nearby, a smaller female sat in a clump of grass. Apparently, while the lower-ranked silverbacks are not supposed to mate with the females, they will sometimes sneak away from the family group and secretly do so. If the top silverback catches them, he will punish them. Soon after, Felicien lead us to the dominant silverback who lazed on his back with a mass of female and baby gorillas around him. 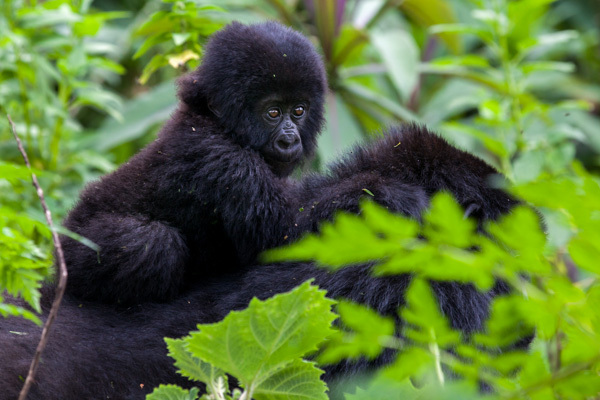 One particularly small baby with sticking-up punky hair–a three-month old, Felicien told us–was particularly fascinating to watch and human-seeming as he climbed all over his mother and demanded her attention while she tried to nap. 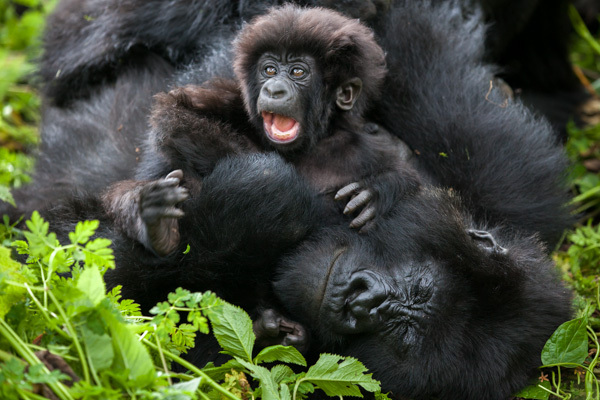 Slightly older gorilla babies playfully rolled around pulling at each other’s hair and somersaulting over the bodies of the adult gorillas. This playful behavior teaches young gorillas how to interact within the group and adult gorillas encourage their play. Gorillas are highly social animals and their family groups are held together by strong bonds between members. 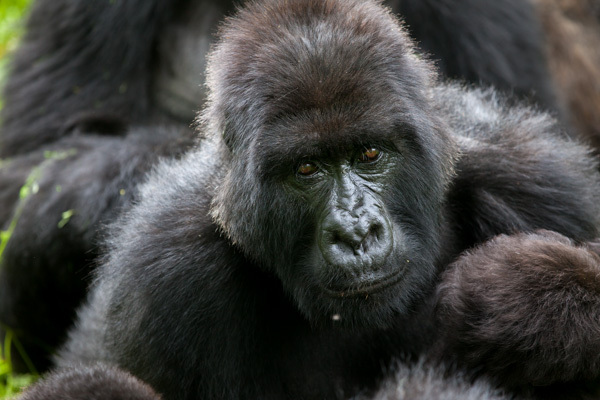 Silverbacks, who are responsible for the family’s safety, are more likely to defend family members than territory and will even go so far as to sacrifice themselves to protect their family. I completely lost all sense of time watching the Ngambara gorilla family. I was struck by the humanness of their interactions–the gentle grooming, the playful tumblings and affectionate intertwining of gorilla bodies. While I’ve seen a lot of wildlife in my time–primarily as a child growing up in South Africa and later on trips to Asia and Africa–there was something particularly powerful and elemental about this experience. I think part of it was that we were essentially in the gorilla family’s intimate space. There was no glass window or car door between us and these primates. In such close proximity, it was easy for me grasp how much we have in common. 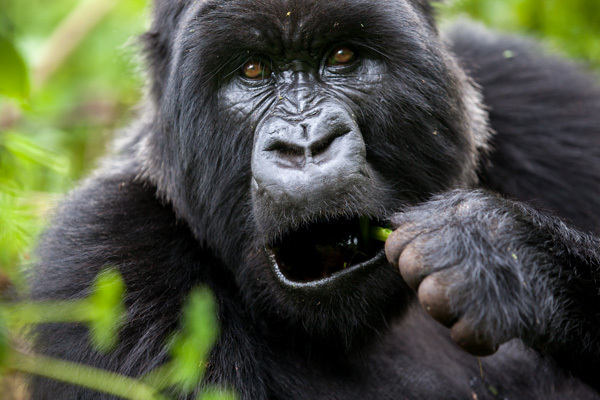 Specifically, we share 98.6% of our genetic code with gorillas and like us, they prioritize family, have human-like hands, have an almost 9 month gestation period, communicate using sound, are susceptible to the same diseases and have a very similar sense of smell, taste and sight. In the final moments before we had to leave, I watched as the mother of the three-month old infant engulfed her son in an embrace. She looked up at my camera momentarily (see top image) and I was so struck by her expression. I thought of my own childhood and the comfort of being held in my mother’s arms and knew exactly how that baby gorilla felt. 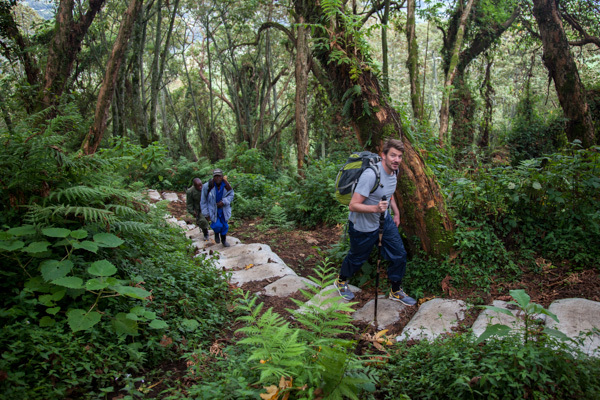 Our group of trekkers hike through the beautiful jungle of Mount Bisoke. Starting off at over 8000ft above sea level, our lungs already struggled with lower oxygen levels and the steep climb quickly left us out of breath. Our guide, Felicien, holds up a giant earthworm common to this region of Rwanda. This area also boasts a variety of other wildlife such as golden monkeys, spotted hyenas, forest elephants, buffalo, giant forest hogs, bushpigs, bushbucks, black-fronted duikers and large variety of birds. The first gorilla we saw was this silverback cradling his head. According to Felicien, he was the second-ranked silverback in the family. Nearby, a smaller female sat in a clump of grass. Apparently, while the lower-ranked silverbacks are not supposed to mate with the females, they will sometimes sneak away from the family group and secretly do so. If the top silverback catches them, he will punish them. A young gorilla rests pensively on its mother's body as she tries to rest. 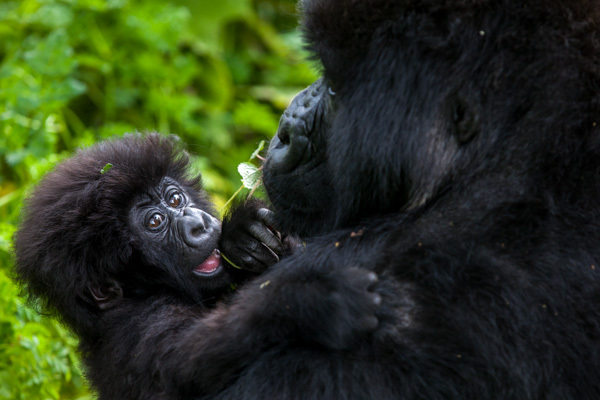 A juvenile gorilla and an infant are surrounded by the lush green vegetation of the Virunga mountains. A three month-old infant is seen through the dense vegetation riding on his mother's back. A three month-old infant clings to his mother's shoulder. I thought there was something so human about the tender relationship between this infant and his mother. An adult female looks at the camera. Each gorilla has a unique nose print similar to our unique finger prints. Researchers use the nose to identify individuals within the family group. A mother gorilla looks exhausted as her infant tries to wrestle with her. Young gorillas are known for their playful behavior, often somersaulting over the adults' bodies and wrestling with each other. This playful behavior teaches young gorillas how to interact within the group and adult gorillas encourage their play. A female gorilla forages for food. A gorilla blissfully scratches an itch. A three month-old gorilla demands attention from his mother while she tries to take a nap. If you or someone you know would like to receive new blog posts directly through your email, please email me at julia@juliacumesphoto.com. Thank you!